We continue to transcribe some of the comments provided by our travelers to the international competition. Paul Stanley, the senior coach, and Toufic Hakim, the AAPT Executive Officer, have been diligent in using their satellite phones to keep in touch with us in the AAPT office. 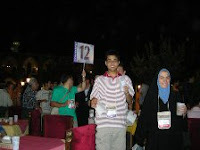 As of 11:45 PM on Monday night (Isfahan time) the coaches are into their eighth hour ensconced with their counterparts from other nations in their common effort to review, refine, and improve the laboratory exam to be taken by the students tomorrow. Following the approval by the international board (consisting of the two coaches from every participating country), the coaches for each team will ‘translate’ the exam into the language and colloquialisms most familiar to their team members. On Monday morning for the coaches and leaders and on Monday afternoon for the students, the groups visited the physics department at the Isfahan University of Technology. They also visited a science park/museum that is designed for hands-on access by children and teens; the museum is a pilot effort that might be replicated elsewhere if it is successful in meeting its objectives. The students are very positive about their exciting experiences in Iran, although they are now second guessing their performances on Sunday’s theory test. Such “second guessing” of their approaches and answers to the questions is quite common in the time between taking the test and receiving their answer sheets and preliminary scores. Students are torn between wanting to forget the earlier test and learning how successful they might have been. While the day time temperature often exceeds 100 degrees Fahrenheit, the evening temperature has been falling into the 70’s; many people take advantage of the night comfort to walk through the streets to savor the beauty and charm of the city. When the students awake tomorrow morning (Tuesday) they will be taking the laboratory or practical exam. At that time, many of the coaches will be trying to catch up on the sleep they sacrificed in order to review and translate the lab exam.